Do you want to spend your holiday in Marbella? Residence Royale selected over 30 luxury villas with private pool in Marbella. Choose one of our luxury villa rentals in Marbella for a wonderful holiday in the sun. Villa Charlene is located in the quiet villa area Nueva Andalucia, only 5 min. from Puerto Banus and the beach. Wonderful, spacious villa with 5 bedrooms, 4 bathrooms, heated pool, air conditioning and WiFi internet! Holiday villa Yvonne is located in the sought-after villa area Nueva Andalucia in Marbella, close to the Las Brisas golf course. It is only a few minutes to the well-known yacht harbour Puerto Banus and the beach. Luxury holiday villa for 10 with 5 bedrooms, 5 bathrooms, heated swimming pool, Jacuzzi, air conditioning and WiFi internet! Holiday villa Chantelle is located in a gated community in the quiet villa area Nueva Andalucia in Marbella, close to the Los Naranjos Golf course. It is only a few minutes to the well-known yacht harbour Puerto Banus and the beach. Lovely holiday villa for 8 with 4 bedrooms, 4 bathrooms, swimming pool, air conditioning and WiFi internet! 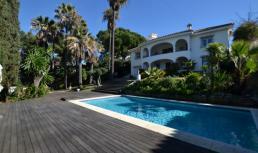 The luxury villa Charlise is located near the Las Brisas Golf course in Marbella only a few min. from Puerto Banus, the beach, restaurants and shops. Lovely modern holiday villa for 10 with 5 bedrooms, 4 bathrooms, air conditioning, private pool and WiFi internet. Perfect holiday villa for large families or golf lovers! Luxury holiday villa Fiona lies within walking distance of the beach (150 m.) in Las Chapas in east Marbella (Costa del Sol). Splendid holiday villa for 12 with heated pool, Jacuzzi, WiFi internet, air conditioning and outdoor kitchen! This luxury vacation villa lies in Marbesa in eastern Marbella, only 250 m. from the beach and 500 m. from the well-known Nikki Beach club. This modern vacation villa with 4 bedrooms, 3 bathrooms, private pool, air conditioning and internet lies in a completely walled garden with absolute privacy! Villa Estrella is located in the quiet villa area Nueva Andalucia, only a 10 min. walk from Puerto Banus and the beach. Lovely vacation villa for 6 with 3 bedrooms, 3 bathrooms, private pool, air conditioning and WiFi internet! Villa Marysa is located in the famous Golden Mile of Marbella within walking distance to the beach and only a few minutes by car to Puerto Banus and the centre of Marbella. Lovely holiday villa for 8 with absolute privacy for 8 with 4 bedrooms, 4 bathrooms, heated pool, Jacuzzi bath, air conditioning and WiFi internet. This holiday villa has only 1 floor and is wheelchair friendly. Villa Bertine lies in a quiet residential areas near the Las Brisas Golf Club, only a few minutes from Puerto Banus and the beach. Lovely modern holiday villa for 8 with 4 bedrooms, 3 bathrooms, private pool, air conditioning and WiFi internet! Villa Bora is located in Marbella at the Las Brisas golf course commanding beautiful views of the Golf Valley. 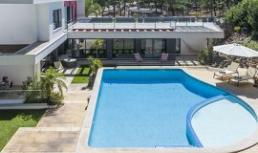 Modern holiday villa with 5 bedrooms, 5 bathrooms, heated pool, air conditioning and WiFi internet, only 2 km. from Puerto Banus and the beach! During our long opening hours you can contact us for advice or questions. You can contact us by phone and email. Our customer service can be contacted 24/7.